Finding the perfect snack for kids is the common dilemma of most moms that I know. Aside from making sure that kids will eat the snack, it should be healthy and taste great, too. I mean, some kids I know are very picky when it comes to snack and the beverage that goes with it. Luckily, Filipino kids can now enjoy Australia's Favorite Kids Juice Drink. If you are like me, I don't just buy snack and drink for my child just because it is recommended by a parent or other kids tend to like it. I also consider its health benefits, and of course, the taste. Yes, I do taste the snack and drink that I give to my child. And why do I have to taste it? Because I want to make sure that it taste good. What I mean here is that, I won't eat something that doesn't agree with me so why would I force my child to eat or drink it, right? So that's how I know that Pop Tops Fruit Juice tastes good. It doesn't have that artificial flavor that my daughter doesn't like. Not to mention that it is not that sweet, nor sour either. Another nice thing about Pop Tops is the cute bottle with a drinking spout that helps avoid spillage and mess. 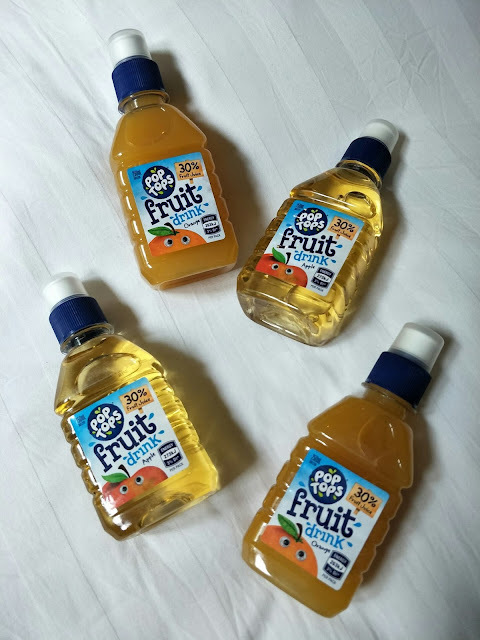 The size (250ml) is also child-friendly so moms need not worry that their kids won't be able to finish a whole bottle. Perfect size for lunch bags or mom's bag! "One of the main dilemmas parents have is persuading their children to eat or drink what they have prepared. Pop Tops prioritizes to make the beverage attractive and easy-to-use for your child, so that they can have all the nutrients in a drink they can enjoy. This makes life a lot easier for busy parents who want the best for their children," shares Hans Nathan Ching, Managing Director for Atlas Global Advantage. Pop Tops is an Australian product and we all know how Australian's are when it comes to eating or drinking healthy and natural food and drinks. The drink is made from real fruit juice, and 30% less sugar and less sodium content, no artificial color, flavors or sweeteners. Pop Tops adhere to Australia's strict food/drink quality control. It comes in two flavors, apple and orange. "Pop Tops was developed with health and safety in mind. It is not enough that each child is satisfied. They have to benefit from what they consume in the long run. Each drink they consume is an investment in their future health, and Pop Tops is the only kids beverage that delivers this in a way that children will love," says Neil Vincent Ching, Director for Atlas Global Advantage. Pop Tops are available in SM Snack Exchange, Rustans Supermarket, Robinsons Supermarket, and SM Hypermarket nationwide. PS. My daughter loves the Apple Pop Tops while I prefer the Orange one.